Adolescents give us the prime opportunity to correct orthodontic malocclusions at an ideal time. By this age, all permanent teeth have erupted, patients are old enough to carefully follow directions, and oral health is usually optimal in this age group. When it comes to aesthetics, we understand the unique concerns of our teenage patients. That’s why we offer clear ceramic braces and Invisalign® clear aligners as cosmetic treatment options. Of course, traditional metal braces are always an option, and can be customized with fun colored elastics to make them unique to each individual. The day-to-day activities for a teen are altered very little with today's modern orthodontic appliances. When we use Invisalign there are no food restrictions at all, and with traditional appliances, it is advisable to avoid foods that are hard or sticky. Brushing and flossing have also become easier, as technology has improved with electric toothbrushes and flossing aides. Dr. Beitchman’s 25 years of experience in orthodontics ensures the best smile in the shortest amount of time for your teen. 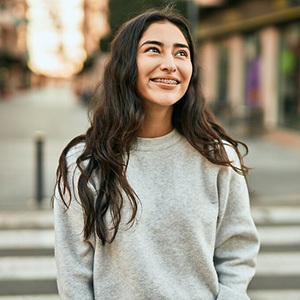 The length of your teen’s treatment will depend on several factors: whether your teen underwent early orthodontic treatment as a child, the extent of treatment needed to achieve optimal results, and the cooperation of your teen throughout treatment. This will be discussed in greater detail during your teen’s initial consultation. When it comes to braces, it’s all about smiles! At Beitchman Orthodontics, we like to take a personal interest in the many hobbies and extracurricular activities in which our teen patients participate. We love to share in the celebration of our patients’ accomplishments, frequently putting announcements and pictures in the office and on social media. During your free consultation, you and your teen can expect Dr. Beitchman to spend a significant amount of time not only diagnosing but also explaining in understandable terms the nature of the problem(s) and how to treat it. Call our San Antonio or Boerne orthodontic offices to schedule your family’s complimentary appointment today!